The remarkable, untold story of World War II American Air Force turret-gunner Staff Sergeant Arthur Meyerowitz, who was shot down over Nazi-occupied France and evaded Gestapo pursuers for more than six months before escaping to freedom. Bronx-born top turret-gunner Arthur Meyerowitz was one of only two crewmen who escaped death or immediate capture on the ground, when their plane was shot down near Cognac, France, in 1943. After fleeing the wreck, Arthur knocked on the door of an isolated farmhouse, whose owners hastily took him in. Fortunately, his hosts had a tight connection to the French resistance group Morhange and its founder, Marcel Taillandier, who arranged for Arthurs transfers among safe houses in southern France, shielding him from the Gestapo. 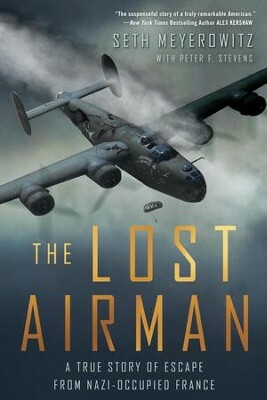 Based on recently declassified material, exclusive personal interviews, and extensive research into the French Resistance, The Lost Airman tells the tense and riveting story of Arthurs hair-raising journey to freedoma true story of endurance, perseverance, and escape during World War II. Seth Meyerowitz, the grandson of U.S. Air Force Staff Sergeant Arthur Meyerowitz, is a web entrepreneur and the president of a global online marketing company. After traveling the United States speaking on behalf of Google for its Get Your Business Online program, his web and marketing savvy allowed him to unearth the declassified saga of his grandfather. Peter F. Stevens is an editor, journalist, and author of eleven books. I'm the author/artist and I want to review The Lost Airman: A True Story of Escape from Nazi Occupied France - eBook.